Fresh from the victory at the Second Battle of Manassas General Robert E. Lee’s Army of Northern Virginia crossed the Potomac River on September 1-6, 1862, to bring the Civil War to Northern soil and to recruit sympathetic Marylanders. Union Gen. George B. McClellan’s Army of the Potomac pursued Lee, who had detached Gen. Thomas J. “Stonewall” Jackson’s force to capture the Union garrison at Harper's Ferry. After the Federals pushed the remaining Confederates out of the South Mountain gaps, Lee awaited Jack return near Sharpsburg and Antietam Creek. On September 17, at the Battle of Antietam, the two armies clashed in the bloodiest single day in American history and suffered some 23,000 casualties. Lee soon retreated across the Potomac, ending his first invasion of the north. Follow in the footsteps of Gens. Lee and McClellan along Maryland Civil War Trail’s Antietam Campaign: Lee Invades Maryland, a 90 mile tour route that allows you to explore the stories of triumph and tragedy at more than 60 Civil War sites. Please travel carefully as you enjoy the beauty and history along the trail. Picnic area is at the far end of the parking lot at White's Ferry. 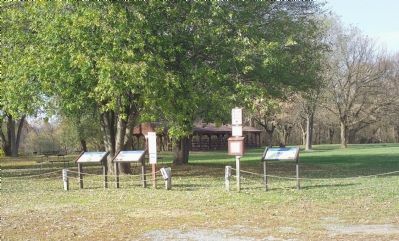 The three markers are at the picnic area entrance. Location. 39° 9.32′ N, 77° 31.101′ W. Marker is near Dickerson, Maryland, in Montgomery County. Marker is on the White’s Ferry parking lot near White"s Ferry Road (Maryland Route 107). Touch for map. It is in a group of three markers at the far end of the parking lot. Marker is in this post office area: Dickerson MD 20842, United States of America. Touch for directions. Other nearby markers. At least 5 other markers are within walking distance of this marker. White’s Ferry (here, next to this marker); Gettysburg Campaign (a few steps from this marker); The Confederate Monument (about 300 feet away, measured in a direct line); a different marker also named White’s Ferry (about 300 feet away); Chesapeake & Ohio Canal (about 400 feet away). Touch for a list and map of all markers in Dickerson. More about this marker. The marker displays pictures of Gens. Lee and McClellan, newspaper drawing of Confederates crossing the Potomac, a drawing of Franklin’s Corps at Compton’s Gap, and a strategic map showing the trail stops. Regarding 1862 Antietam Campaign. 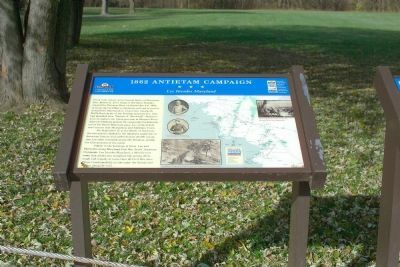 This marker is one of the standard set used to orient travelers to the Antietam Campaign. More. Search the internet for 1862 Antietam Campaign. Credits. This page was last revised on June 16, 2016. This page originally submitted on January 13, 2007, by Tom Fuchs of Greenbelt, Maryland. This page has been viewed 2,389 times since then and 10 times this year. Photos: 1. submitted on January 13, 2007, by Tom Fuchs of Greenbelt, Maryland. 2. submitted on January 12, 2007, by Tom Fuchs of Greenbelt, Maryland. • J. J. Prats was the editor who published this page.